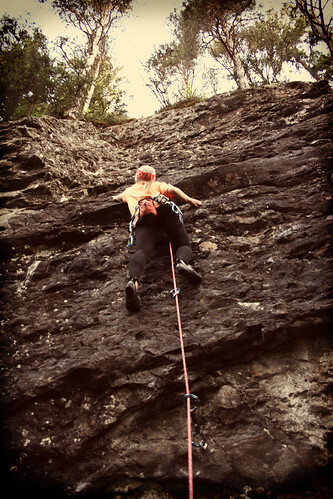 Before we came to Norway for the summer, we made plans to try and go rock climbing as much as possible. 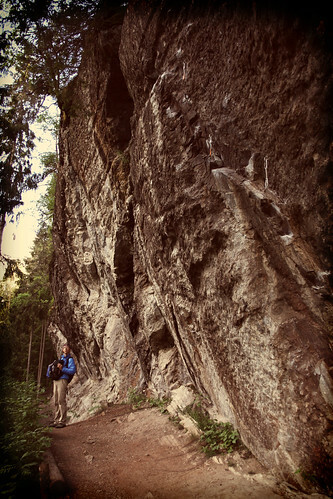 Norway is really famous for its fjords and mountains, but it's also famous for rock climbing because of all of the glacially eroded landscape and exposed cliffs. All ready to go Saturday morning for a bike ride to Hell and back. So on our second full weekend here, we decided to pick up a climbing guide book at the local sports shop, and pick a place nearby. It was supposed to be pretty good weather, so we decided to go to the place that had the most sport routes to offer, which was a crag called Hell (named after the town it was near, called Hell)! It wasn't too far away, just about 40 km or so from where we were staying. It was actually near the airport that we flew into, so we already kind of knew where it was. We found out that we could go very easily by bus or train (since there were already a lot of transportation options established to go to and from the airport at all hours). But being Norway, the bus and train tickets just to go to the airport would've cost us at the minimum $50! And if we wanted to bring out bikes with, we had to pay for them like they were an extra person! On the way, we took a break to have some Diplom-is ice cream! 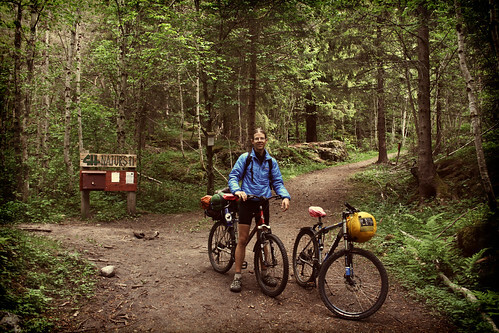 So being cheap (actually, more like thrifty or frugal) we got the idea to just bike to Hell. 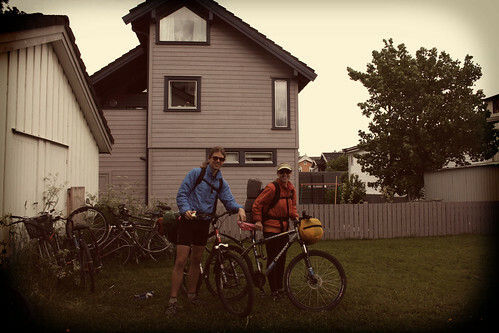 We've done 40 km bike rides before (albeit on lighter road bikes at home), so the distance wasn't going to be a problem. What we had never done before was bike with a bunch of gear. We needed to take about 25 lbs of climbing equipment (a rope, quick draws, harnesses, shoes, slings, etc) and on top of that, all of our camping things (a tent, thermarest pads, sleeping bags, and warm clothes). Oh yeah, and some food too! We found a cool camping spot right near the climbing wall. Well, we weren't exactly sure that we could do it, since we had no pannier bags or anything for the bikes except one rack over the back wheel of Romy's bike, and two backpacks. When we laid all of our stuff out in our bedroom, we realized it wasn't all that much, but it was kind of heavy. We put half of it inside backpacks, and the rest we tied with some rope to the back rack of Romy's bike. 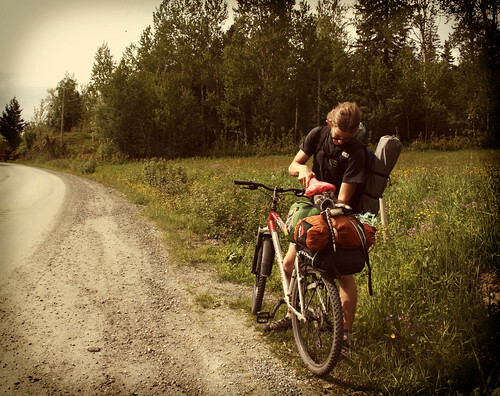 Then we strapped our sleeping bags to the handlebars, and we were pretty much ready to go! 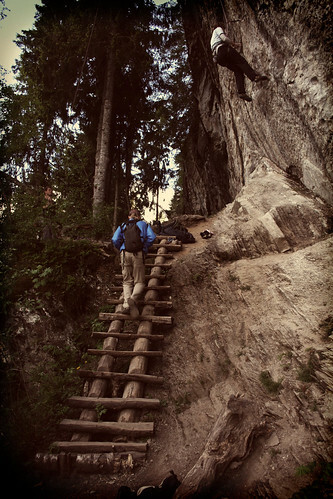 A stairway to climbing heaven in Hell! Romy looked at Google maps before hand so that we knew where to go, and wrote it all down on a piece of paper. We made sure to eat a good breakfast, and then we rolled out, at about 11am on Saturday morning. I was concerned that we left too late until I realized, why? It never gets dark here so it doesn't matter what time we actually show up! The ride took us quite a while (about 4hrs), but we crossed some nice terrain and stayed along the fjord just about the whole way. Most of the way, there was a dedicated bike path which made the riding very easy and smooth. We just followed the bike path, and occasionally, we had to turn off or cross the road to the other side. The route had a few hills, but it was pretty much flat since it followed the water. The wall at Hell isn't that high, but it is overhung. Soon we were nearing the airport, and we could see the control tower and some big planes flying in and out. At that point we stopped at a river to refill our water bottle, and also stopped at the last grocery store before the climbing area to get some food (we planned on buying it last minute to avoid carrying food with us). We had to try some of the Norwegian ice cream too, even though it was getting cold out (damn Norwegian weather). The brand was called Diplom-Is, and they make ice cream like drum sticks. I must admit, the ice cream was not as good as Finland's Ingman-S cones, but it wasn't bad! I am lead climbing our first route that evening. After we were on our way again, we started looking out for signs pointing to a big sports complex and stadium. The crag was just beyond it, on a forested hillside. It didn't take long until we were there, just a few miles. At the stadium parking lot, we found a sign pointing to the path that lead up to the rock wall. 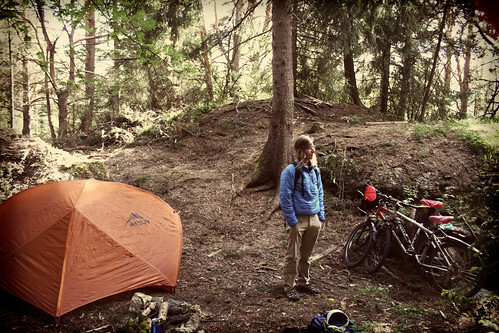 We dragged our bikes up the steep trail, and started looking for some camping spots. In Norway, there's something called All Man's Right, which allows anybody to walk over any land (private or public) and camp anywhere as long as it's not too close to somebody's house. So as long as we found a nice camping spot, there was no question of whether or not we could camp there. We eventually found a spot which we cleared out for the tent, and it actually was very close to the climbing wall. In fact, we could hear the climbers yelling and laughing. Romy is ready to get his climbing action on! We set up our camping spot, and then took a nice break for a few hours. We relaxed after biking for so long, and had a snack. We read the climbing guide to see which routes we wanted to climb, according to their rating (which was given in the Norwegian system and French system). Around 6:30pm, we decided it was time to climb! The sun started peeking through the clouds, and it was actually warming up. Perfect climbing weather! So we got all of our gear together and started heading up the trail to the wall. When we got there, the first section was extremely overhung and some people there told us that those routes were all really hard. We kept walking to the easier stuff, and the wall was getting less and less overhung. Finally we got to a place where there were benches set up, and a fire pit. 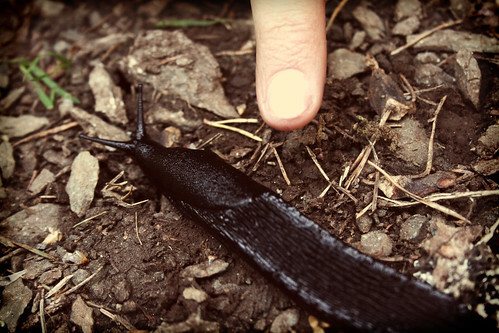 A huge black banana slug from Hell! The routes in the easier section weren't very high, but they were vertical or slightly overhung. The rock was a conglomerate, but smooth, sharp and hard like granite. We picked an easy one to start with, and I lead the first route. It was a lot of fun! Then Romy lead one that was close by, which was also cool. Although there weren't a lot of jugs, there were a bunch of deep pockets on the easier routes. From there, we just kept hopping from anchor to anchor and top roping the rest that were within reach. We climbed until 10pm or so. It was amazing, because we had no idea what time it was because the sun was shining on us and it felt like mid-afternoon! When our arms were tired out, we still had a bunch of energy, so we went back to our tent and put all of our climbing stuff away, and went on a hike. We started walking up a trail that took us to the top of the hill. We discovered that up there was a huge bunker thing and an artillery storage room built during the second world war. Now it was all abandoned and grown over. We sat and watched the sunset from the top. Then we headed down and went to sleep. I had to put eye covers over my eyes because the sun was too bright to sleep otherwise. Heading back home after a strenuous weekend (and more to come). The next morning we woke up kind of late. 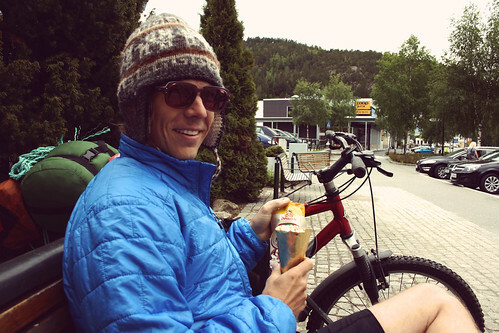 We had plans to try and climb again that morning, but decided we should just head back, since we planned on taking a slightly longer and harder bike route back that would take us through the mountains instead of along the fjord. It didn't take us long to pack up. This time on our way out, we took a different trail out of the climbing area, one that was much wider and graded (it used to be an access road to the bunker at the top of the hill). We were out of there in no time, and hit the real road soon after that. The route we took back went along a two lane country road for about 6 km, and then turned into the mountains onto a gravel and dirt graded road that was actually private. I think cars are required to pay a toll to use it, but since we were on our bikes, we just ignored the sign and kept going. It was basically like a national forest road back in the US. It was really nice and scenic and took us through the forest, past small farms, and along several rivers. We passed many camping areas, and even a waterfall! We took a nice break by a river and it was sunny! The biking was getting very exhausting though because we kept having to go up and down and up and down! We took so many breaks along the way because it was tough! Towards the end, we went past a huge reservoir lake (it was natural but reserved for drinking water). It was pretty sunny the whole way, but storm clouds were brewing in the distance. Then suddenly, it started pouring and we tried to take some cover under a stand of trees. We avoided most of the rain like that, but we still got wet. However, as soon as the rain passed, it got so sunny and hot that we dried out almost completely within 1/2 hour! That was nice! It took us over 6 hours to get back home. When we got home, we had just only enough energy to unpack and make dinner. Then we crashed! By the end, Romy was carrying a lot of stuff! We had a bunch of fun on the bike trip to Hell and back. 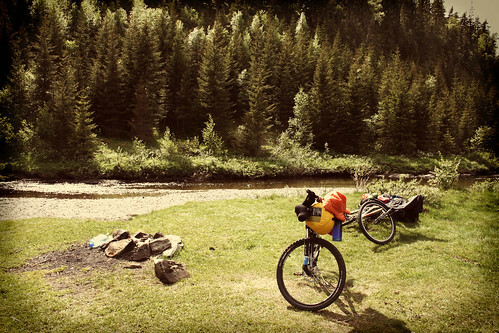 I was so surprised that we were able to carry all that stuff on two crappy mountain bikes, and with no special gear except two backpacks and a rack over the rear tire. And the best part, it didn't cost us anything, which was great!